SG-1 discovers Daniel Jackson alive and living on an alien world, with no memory of who he is. The team hatches a plan to lure Anubis into a trap and destroy his new super-weapon. On the planet Vis Uban, once home to the Ancients, a group of nomadic villagers walks across the field toward the forest. There is a brilliant flash of light, and a man appears, naked, lying on the ground. They approach him and ask him who he is, to which he replies, “I don’t know.” It is Dr. Daniel Jackson. On Earth, Jonas Quinn continues his attempts to translate the tablet of the Ancients discovered on Abydos (“Full Circle”), which supposedly tells of the Ancients’ Lost City, where they hid much of their advanced weapons and technology. Using Dr. Jackson’s notes as a reference, Jonas stumbles upon a revelation, and rushes to tell General Hammond and Major Carter. 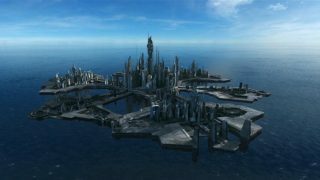 Jonas theorizes that the Ancients couldn’t have actually lost a city — they only abandoned the newest city they were constructing when a plague nearly destroyed their civilization (when those who survived ascended to a higher plane of existence). Vis Uban was to be the crown jewel of their civilization. Since it was unfinished, it would probably be the last gate address on the list of those that Colonel O’Neill entered into the base computer when he had the Ancients’ library downloaded into his brain (“The Fifth Race”). SG-1 gates to the planet and find the ruins of a half-built city. A nomadic group of humans have moved in, and have taken in a stranger they found. The team is astonished to see Daniel walk into the village, dressed as one of the villagers. He has been living there for two months, and has no memory of who he is (or who they are). 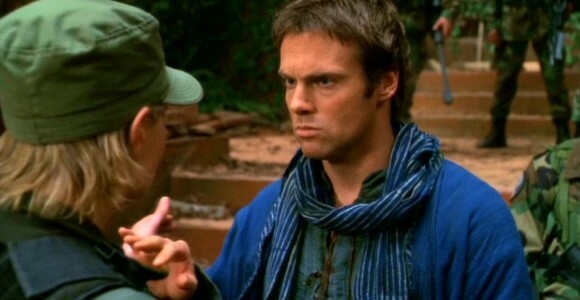 The team tries to remind him of his life on Earth, as a member of SG-1, but Jackson is reluctant to explore any of it. He fears that he has done something terrible, or that something terrible has happened because of him and he’s not sure he will like the person he use to be. Nevertheless, he finally agrees to return to Earth with SG-1. O’Neill shows him to a room on the base where he can stay, where they’ve unpacked some of his personal belongings. Daniel finds a photo of Sha’re, his deceased wife, and begins to make a connection with his past. He excitedly talks of her to Teal’c, who must tell Daniel that she is dead. As he continues to explore his past and speak with his friends, some memories begin to return to him. The team theorizes that his amnesia may have been a punishment for breaking the Ancients’ rules and interfering, but that Oma Desala (his ascended mentor, and always one for toeing the line) may have made it an imperfect amnesia to get around the sentence. He will regain his memories in time. The S.G.C. combs the ruins at Vis Uban, but finds nothing in the way of advanced technology. Daniel discovers that he has retained the ability to read the Ancient language, and corrects Jonas’s translation and interpretation: the Ancients hid their “Lost City” when the plague wiped out their civilization. Now, Vis Uban provides them with an opportunity to lure the powerful Goa’uld Anubis into a trap, in order to destroy the new super-weapon that Jackson handed over to him (“Full Circle”). The Tok’ra make sure that Anubis finds a fake version of the Ancients’ tablet, leading him to Vis Uban. Once he arrives, O’Neill and Carter will pilot the F-302 through the ship’s shields (with an instantaneous hyperspace jump, made possible by the rare element naquadria) and destroy the super-weapon’s exhaust system — destroying Anubis’ big advantage over the Goa’uld System Lords. But first, Daniel and Jonas ambush a pair of Jaffa and ring up to the ship. They have been injected with a radioactive isotope developed by the Tok’ra, which will shield their life signs from the ship’s sensors for exactly eight hours. The two access a computer and find the location of the exhaust vent, relaying it to O’Neill and Carter in time for the attack. Meanwhile, Teal’c pays a visit to Lord Yu and proposes a temporary alliance in order to destroy Anubis’s advantage over Yu and the rest of the System Lords. Yu will take the System Lords’ fleet into battle at Vis Uban, attacking Anubis after the weapon is destroyed. Yu agrees, and Teal’c remains on board the flagship with his First Prime — who is concerned about his ailing master’s physical and mental health. The F-302 effectively engages a squadron of death gliders, destroying one of them with its new weapons system. The hyperspace jump is effective at getting them past the shields, and the target is hit. A massive explosion rocks the ship, and the super-weapon is eliminated. The fleet, however, never arrives. Yu orders his First Prime to turn the fleet around, and Teal’c is thrown into a prison cell when he objects. Anubis is furious, but he does have one consolation prize. His Jaffa capture Jonas, while Daniel escapes into the bowels of the ship. Jonas swears to tell him nothing, but Anubis reveals his intention to implants a device into Jonas’s brain that allows him to download everything he knows. “They’ve tentatively dubbed these episodes ‘Falling’ [sic] and ‘Homecoming.’ They mostly center around the character of Daniel coming back, though that’s not the central conflict or the point of the story. In that regard you could compare him to Spock in Star Trek: The Voyage Home. Daniel is somewhere and the SG-1 team has to find him, and then he has to complete the journey and get back to human form. “[Executive producer] Robert Cooper and I have talked about what supposedly happens off-camera [between the end of ‘Full Circle’ and the beginning of Season Seven] and, in true Stargate tradition, Daniel is left to make a choice. Basically, it comes down to the philosophical difference of Daniel realizing that what he thought of as Utopia is actually full of dos and don’ts, and he’s not actually going to accomplish much by staying on the path he’s currently on. So, rather than stay and continue his spiritual journey, Daniel chooses to go back and conclude the unfinished business in the ‘real’ world, as it were. “What I’ve been told, what I’ve agreed to when talking to Rob Cooper, is that it can’t be that Daniel comes back and everything goes back to the way it was before he left, because that would mean the show wasted a year evolving in a different direction without him. It also means the character wasted a year not evolving properly as well. I think there has to be some sort of evolution or change to Daniel when he comes back. It certainly needs to be so in order to justify why he’s left the Ascended. We need to know how he feels about them, about the universe, how he feels about being back, what his future plans are now and what he wants to pursue. “[Daniel] really struggled with it and felt like finally, maybe he had been lied to a little bit, and that what was doing on was a bit hypocritical from the other’s point of view. And so he decided to get involved, and he got his wrist slapped in a very severe kind of way … I think fans will see a season one Daniel out of him, and the whole storyline of him being punished and having to start fresh gave him a story reason for going back to that original, slightly less tainted, wide-eyed positive Daniel. “Before work began on the show’s seventh season, I emailed Rob Cooper a notion I had of an angel cast down from heaven, stripped of his memories and left to start a new life on Earth. Rob ended up taking the whole ‘stripped’ thing literally — much to the delight of Michael’s fans. “Paul flagged an exchange at the script stage. One off-worlder notes Teal’c’s presence with: ‘He is Jaffa’ to which O’Neill replies: ‘No, but he plays one on TV.’ Paul felt it broke the fourth wall but was ultimately overruled. When the episode aired, many fans loved the exchange — while many others followed suit and waved their own red flags. VOTE! How would you rate SG-1's "Fallen?"